Olive Oil, Distilled Water, organic and sustainable Palm Oil, Coconut Oil, Lye, Castor Seed Oil, Shea Butter, Goat Milk Powder, Black Raspberry Vanilla Fragrance Oil, Oxide for color. Razzle Matazzle, you say? 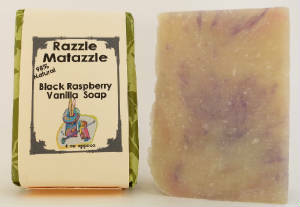 One sniff and you will see the magic of combining raspberry and vanilla. Our secret trick is the shea butter! Seriously this one smells good enough to eat...and nearly every age group likes it! If you are a grandparent buying for the little ones--get this one. The goatmilk adds a creaminess to the lather. All in all it is a best seller at shows and on the website...every quarter.